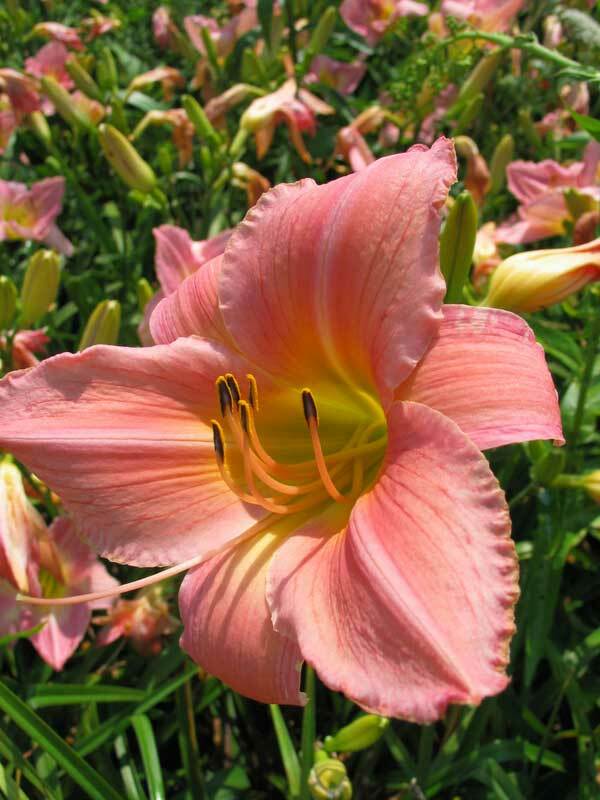 Simple but perfect, this variety has it all: clear, clean pink, vigorous growth, and lots of big, gorgeous blooms. Only received this as a free bonus January 2018. 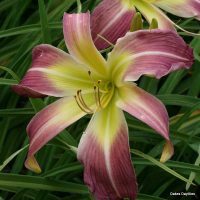 Just saw my first flower today (June)..very pretty, your daylilies really are big and beautiful…and this is in a pot,not the ground..Thank you. I can’t stop looking at it. Mine is more of a peachy/ coral than pink. The Ag man says it’s probably the amount of acid/ or lack thereof that makes it not quite as pink. I do have poor soil, but try to fertilize each spring and supplement with a little potting soil. Still , it is just a lovely flower. Just love it. Also. It has already bloomed and it has only been in the ground a month or so! 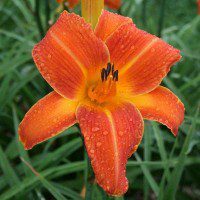 Had your daylily since 2009 and it always is substantial, beautiful and full of blooms. Thanks! 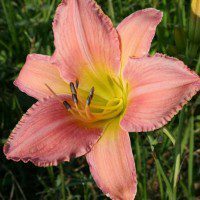 I reviewed this daylily last summer, when it bloomed in July after being planted in October 2016. Now that it’s had a second year to settle in, it’s really taken off! Huge bright pink blossoms make it so impressive. 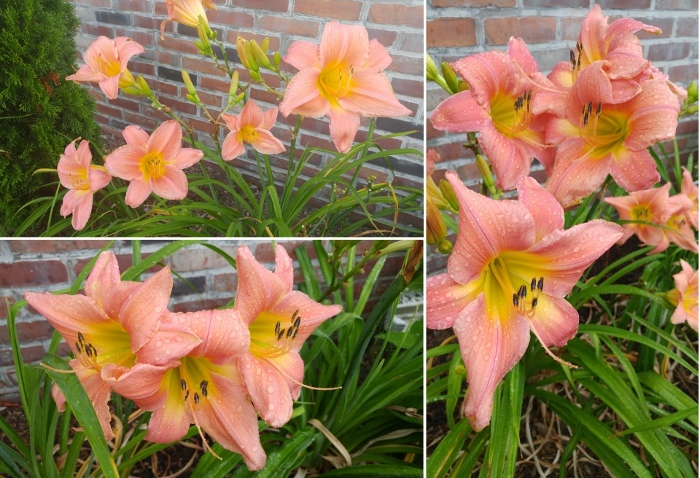 Here are some photos from a typical July day – and I only ordered 1 plant! 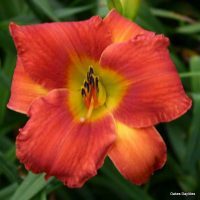 Of all the daylilies I’ve grown throughout my 43 years of gardening, this was one of three I chose to take with me when It was time to leave my large home and move into a small home. 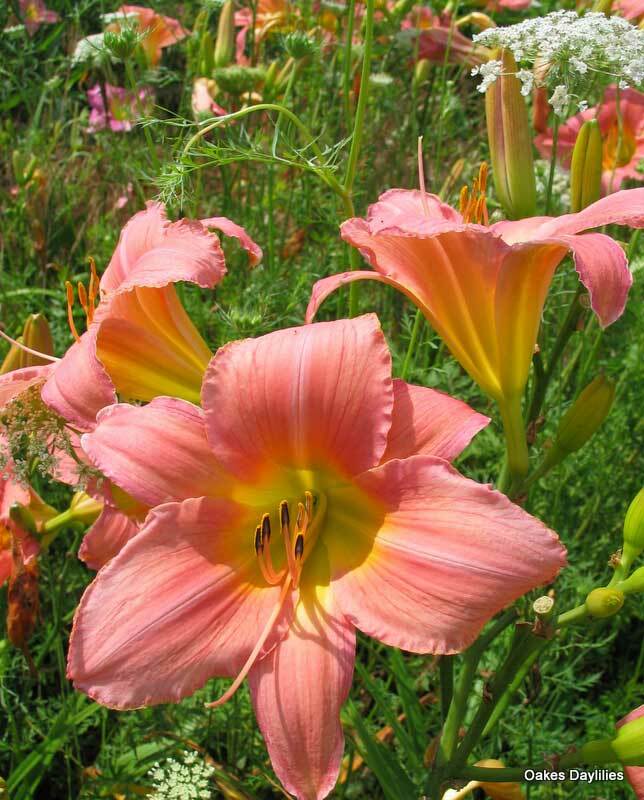 It was at least 20 years old by then and had been split into several segments—all of them producing the same strong tall stalks and prolific flowers of such an indescribable color. You can say pink and you can say coral but that doesn’t really do it justice. Now it blooms outside the front door of my one-level house and is the first thing I see when I open the door. I love this flower. It is such a joy..
One of my very favorites! 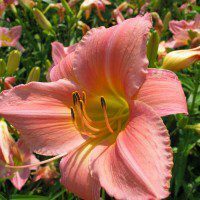 I love the large size, open form and slightly peach pink color. 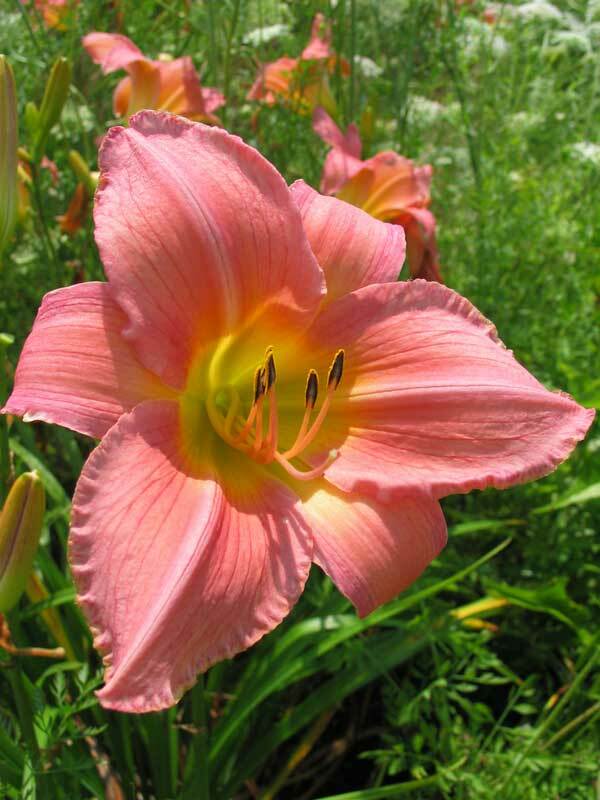 Every pink daylily I look at is always compared to this one. 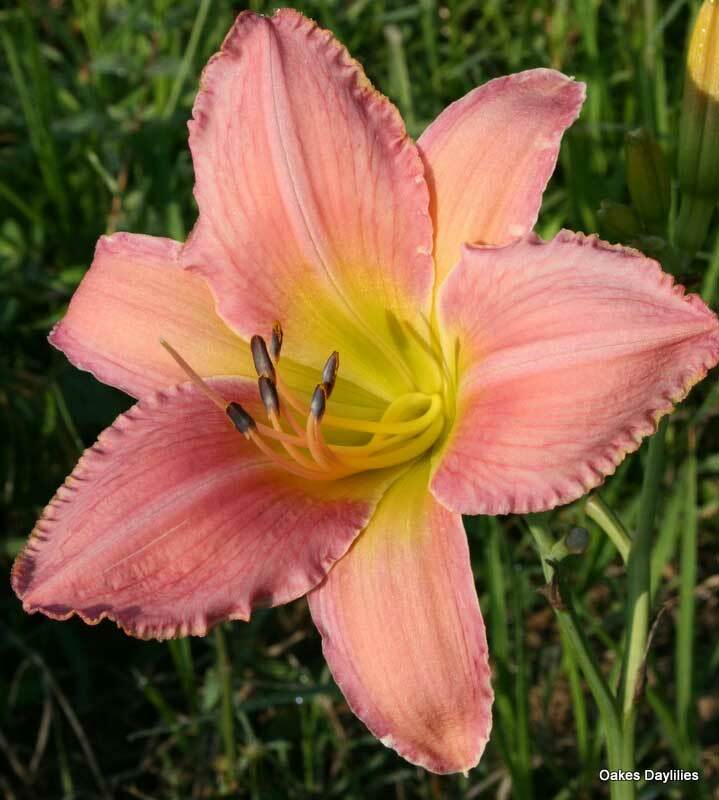 The Corryton Pink usually comes out the winner. I got this as a free plant, and am very pleased. 1st year and the plant has large flowers and several scapes so next year should have more scapes and be taller. But it is very pretty looks alot like Persian Market, I have them together in the same garden and you can hardly tell them apart .Love Them both!! The pictures do not do this bloomer justice! Each year when it opens I’m stunned all over again. 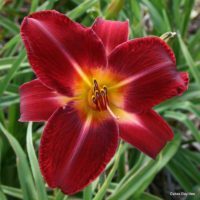 Huge, rich-colored blooms that hold their own in sun, rain and wind. Gorgeous color. Just like the pictures. Prolific bloomer! 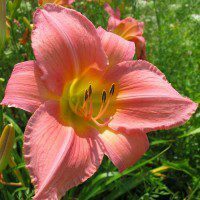 I planted an all pink daylily garden this year and this was the first to bloom. I have to say too that it bloomed a peachy pink here. It is beautiful, but I was a little disappointed because I was looking for pure pinks. I hope when the garden gets established that they will all blend in together nicely without clashing. This is a plant that I received as a free bonus with my first order 8 years ago. 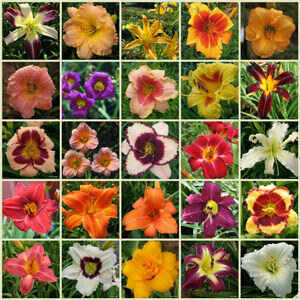 It is now one of my top favorite of the 30 varieties that I now grow. 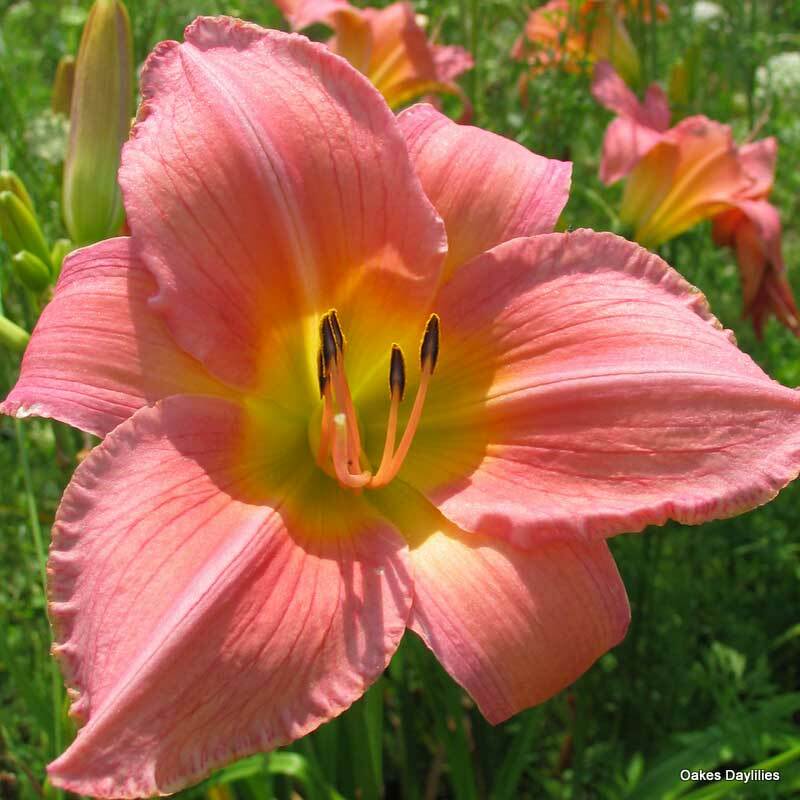 The colors are extremely vibrant and the blooms are huge. It didn’t bloom the first year in my location but has since produced extraordinary flowers every year. Highly recommend!!! 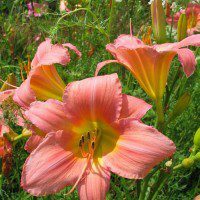 Peachy-pink in our soil, but the longest display of any peachy-pink daylily in my garden. The perfect pink flower. It stands out in a mixed border. It is another one of my favorites. 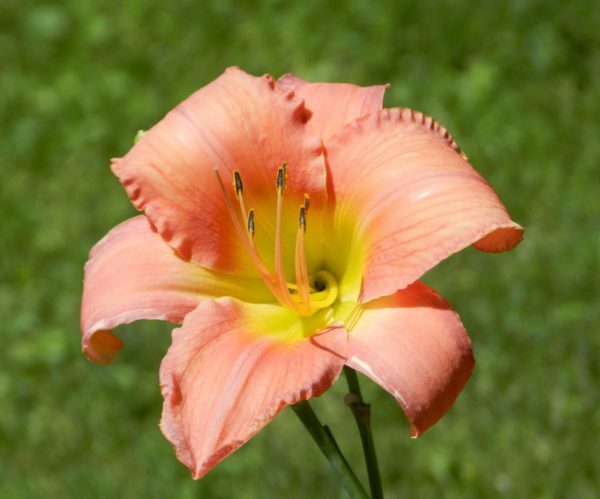 Worthy of any day lily collection. Absolutely gorgeous. 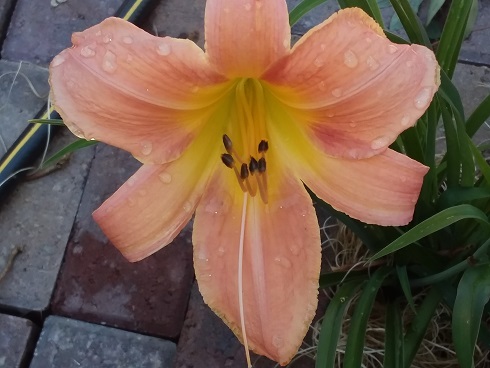 This beauty has been blooming profusely for 4 weeks in my garden and its the second year in the garden. Vigorous grower and bloomer. A must have for your garden. One of the best pinks we’ve found for landscape performance. Large flowers on tall-ish well-branched scapes make a grand statement, although not necessarily a brilliant one because of the soft pastel color. Sells out to garden visitors whenever we have it available. No rebloom here, but enough buds are produced to make a long display. Hardy, healthy garden plant that multiplies well.